Scrolling down R.O.C.K.’s Facebook page one day I noticed a new category amongst the familiar headings. 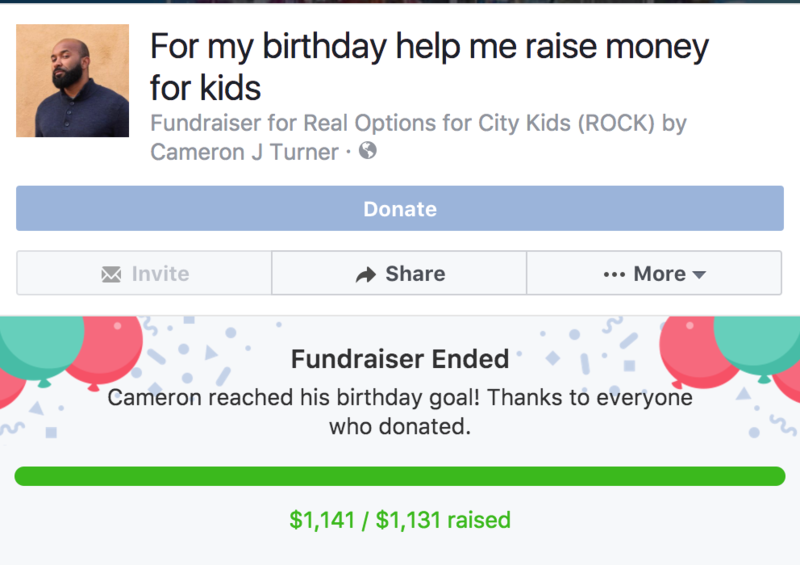 Fundraisers: Facebook’s new tool that allowed Cameron Turner, a R.O.C.K volunteer, to raise $1,141 for R.O.C.K.! Depending on when your birthday is, you may have already seen this prompt popping up on your notifications feed. Facebook asks you, or actually encourages you, to do a little good for your special occasion by creating a fundraiser for your favorite charity. When Cameron described the process to me, he told me it was a no brainer. After Cameron’s experience volunteering at R.O.C.K.’s Lil’ Kids Camp this summer, he knew he would be asking his friends to support a worthy cause. The online fundraising campaign was easy to set up, and it made so much more sense than getting unnecessary presents or having people buy him a drink for his birthday. This has made an amazing impact for R.O.C.K. With $1,000 we are able to send 10 kids to Lil’ Kids Camp or send 50 kids on an outdoor adventure. The impact is huge while the effort is tiny. Contact Sarah@rocksf.org for a Happy Birthday R.O.C.K. campaign banner, pre-made posts, a R.O.C.K. fact sheet, and other treats that are sure to attract donors and make raising money as easy as eating cake, birthday cake that is. Or if you are not on Facebook but still think we are awesome and worthy of some birthday fundraising, we have other online fundraising platforms that we would be happy to share. Just send me a message and I can support you through creating a page with us. We know that without supporters like you, we never could have made it to 23. R.O.C.K. is so grateful for our community that keeps showing up, pitching in, and making the good work we do at R.O.C.K. possible. Thank you, and happy birthday R.O.C.K. !